In the human brain, functional activity occurs at multiple spatial scales. 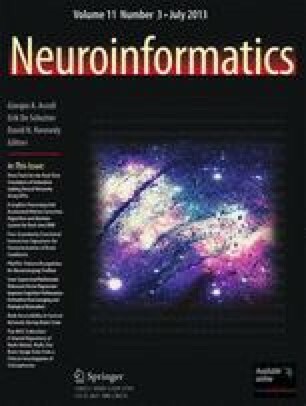 Current studies on functional brain networks and their alterations in brain diseases via resting-state functional magnetic resonance imaging (rs-fMRI) are generally either at local scale (regionally confined analysis and inter-regional functional connectivity analysis) or at global scale (graph theoretic analysis). In contrast, inferring functional interaction at fine-granularity sub-network scale has not been adequately explored yet. Here our hypothesis is that functional interaction measured at fine-granularity sub-network scale can provide new insight into the neural mechanisms of neurological and psychological conditions, thus offering complementary information for healthy and diseased population classification. In this paper, we derived fine-granularity functional interaction (FGFI) signatures in subjects with Mild Cognitive Impairment (MCI) and Schizophrenia by diffusion tensor imaging (DTI) and rs-fMRI, and used patient-control classification experiments to evaluate the distinctiveness of the derived FGFI features. Our experimental results have shown that the FGFI features alone can achieve comparable classification performance compared with the commonly used inter-regional connectivity features. However, the classification performance can be substantially improved when FGFI features and inter-regional connectivity features are integrated, suggesting the complementary information achieved from the FGFI signatures. T Liu was supported by the NIH K01 EB 006878, NIH R01 HL087923-03S2, NIH R01 DA033393, NSF CAREER Award IIS-1149260, and The University of Georgia start-up research funding. X Hu was supported by the National Science Foundation of China under Grant 61103061, the China Postdoctoral Science Foundation under Grant 20110490174, and Special Grade of the Financial Support from the China-Postdoctoral Science Foundation under grant 2012 T50819. J Han was supported by the National Science Foundation of China under Grant 61005018 and 91120005, and NPU-FFR-JC20104. L Wang was supported by the Paul B. Beeson Career Developmental Awards (K23-AG028982) and a National Alliance for Research in Schizophrenia and Depression Young Investigator Award. D Shen was supported by NIH R01 grants EB006733, EB008374, EB009634, and AG041721. Bickel, S., & Scheffer, T. Multi-view clustering. In Brighton, United kingdom, 2004 (pp. 19–26, Proceedings—Fourth IEEE International Conference on Data Mining, ICDM 2004): IEEE Computer Society. doi: 10.1109/icdm.2004.10095. Cai, X., Nie, F., Huang, H., & Kamangar, F. Heterogeneous image feature integration via multi-modal spectral clustering. In Colorado Springs, CO, United states, 2011 (pp. 1977–1984, Proceedings of the IEEE Computer Society Conference on Computer Vision and Pattern Recognition): IEEE Computer Society. doi: 10.1109/cvpr.2011.5995740. Chang, C. C., & Lin, C. J. (2001). LIBSVM: a library for support vector machines. http://www.csie.ntu.edu.tw/cjlin/libsvm. Li, H., Xue, Z., Ellmore, T. M., Frye, R. E., & Wong, S. T. (2012a). Network-based analysis reveals stronger local diffusion-based connectivity and different correlations with oral language skills in brains of children with high functioning autism spectrum disorders. Human Brain Mapping. doi: 10.1002/hbm.22185. Verma, M., & Howard, R. J. (2012). Semantic memory and language dysfunction in early Alzheimer’s disease: a review. International Journal of Geriatric Psychiatry. doi: 10.1002/gps.3766. Zhu, D., Li, K., Guo, L., Jiang, X., Zhang, T., Zhang, D., et al. (2012b). DICCCOL: Dense Individualized and Common Connectivity-based Cortical Landmarks. Cerebral Cortex. doi: 10.1093/cercor/bhs072.